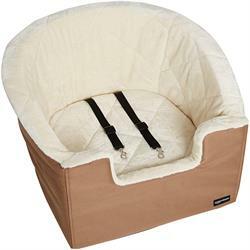 -Bucket-style booster seat keeps pet in one place for distraction-free driving; fits in front or back seat of vehicle. -Quilted flannel plush top for cozy comfort; durable oxford fabric along the sides and bottom. -Includes an adjustable security leash for clipping to a harness; machine washable for easy cleaning -Measures 18.5 by 17.7 by 15.7 inches (LxWxH); weighs about 2.6 pounds.